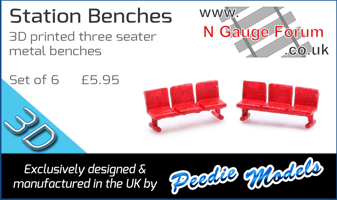 Farish Mk1 coaches - new version. Re: Farish Mk1 coaches - new version. The RU has been produced as a new tool model in BR Maroon at least - 374-121A I have in box right here in front of me. It's a new tool superdetail version with interior, close coupling etc; not derived from the old Poole printed sides models. There have been at least 2 versions in Crimson & Cream, 2 in Maroon and 1 in Blue/Grey that I know of since 2013, but the last Chocolate & Cream one was pre-Blue Riband in 2011 I think. Probably the 8 versions of the RU before Alan's 374-121A were not the new tooling but maybe the 374-122 Blue/grey version is? While i was typing this, Carderrail got to it first! I wonder why there are two different ref no's with the same running no. Are there any instances of this with other BachFar items, or could it imply detail differences such as bogies perhaps? I think it is simpler than this. There were not that many RUs of this design (which I think is diagram 23) built pre 1956, and this may reflect which ones were definitely recorded in particular liveries. Most were built post 1958, hence the chances of seeing them in crimson/cream is low. The version Bachmann model starts with coach no 1900 and ended with 1991. Bachmann does do its research quite well. Having been awaiting the introduction of a Farish BR Mk1 Restaurant Unclassified in chocolate & cream for a long time, I am a little puzzled not to have found any news so far. According to http://ngauge.org.uk/bac_pass_mk1_buffets.php , there were two pre-Blue Riband models 374-117 and 117a, but lacking interiors and the extra details/close couplings would not really go with an adjoining RFO. Perhaps I have missed something, somewhere. Has anybody an idea why this particular livery is not yet available please? Looks like your wait may soon be over. 374-123 MK1 RU in Chocolate/Cream was announced last month. Thanks for flagging that up. I had somehow missed the announcement. Yes, I was starting to think I'd need to repaint a maroon or blood and custard one. It also means I can consider whether I need to renumber the RMB I have from W1813 to one of the previous batch, or fit the proper bogies to it as built. Anyone know if it will have an interior unlike the earlier 374-117? Based on the other RUs it will have a detailed interior. As I have reliably informed that none of the BR Standard RMBs ever carried WR Chocolate & Cream livery -- they were delivered too late -- you'll have to use 'Rule One', like me. for the livery, so why not for the bogies, too? Do you mean BR Standard vs Commonwealth bogies, Ollie? Finally got round to playing with the birthday coaches. The crimson & cream restaurant car was in newer packaging, the level of detail is amazing. Put it next to an old one I bought off ebay & the new one looks even better. For all we may moan about increasing prices, there is no denying Farish are turning out some stunning models. I spoke to someone om the Bachman stand at ally pally on Saturday and asked him why no date had been set for the release of the chocolate/cream RU - he said he didn't know as it was not on his list so it may not appear until 2019!. I told him that given that this was a re livery of an existing vehicle, that it seemed rather pointless announcing it in 2018 then.